Artsy fartsy day. Here is story that combines no fewer than five things I am currently interested in: (1) Going to estate sales where I must buy something. (2) Buying costume jewelry — preferably pins, because they usually very pretty, they usually are very inexpensive ($1 or less) and they take up much less room, as a collection, than wagon wheel lights. (3) Collage. 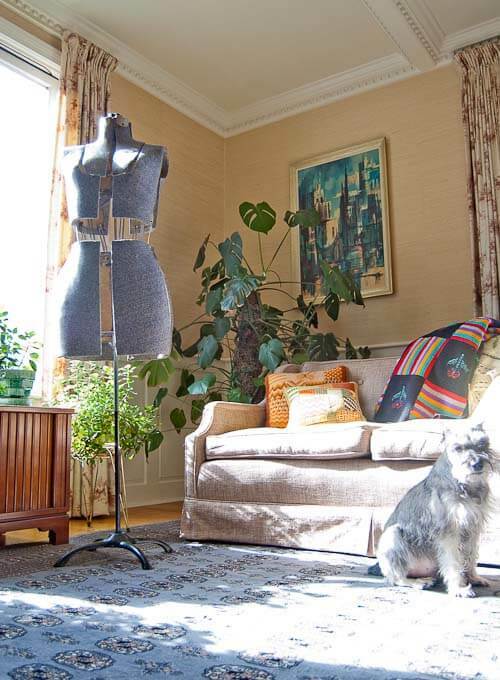 (4) Making clothing out of recycled wool sweaters — hence, the purchase last year of the vintage dressmaker dummy. (5) My office design update. So, earlier this week, as I contemplated my latest project — my office redesign to add more crafting space — I took the pammy wammy director chair that I received at the Shaw HGTV Home Floors event out of my office. I love it because it has my name on it, and yes, it’s all about me me me. But I only stashed it here because it fit. It is a parking space for Astro-stuff of other stuff. So up it went to the attic hoard, where it awaits potential future use or the Goodwill when I get around to cleaning out the attic hoard. 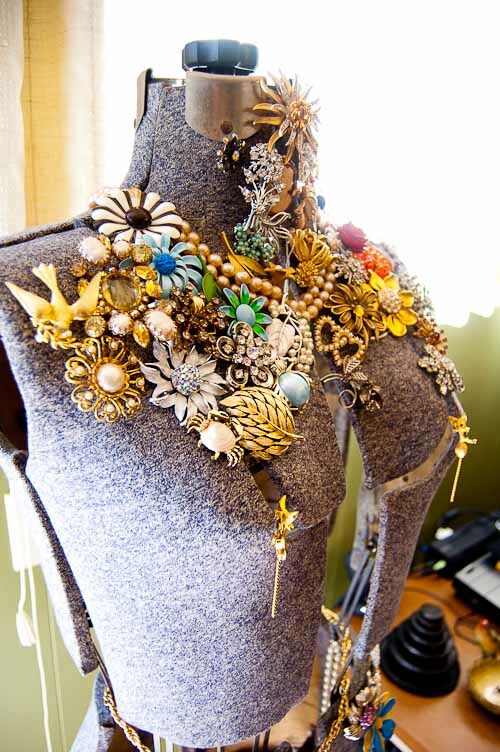 “In” went the costume jewelry collage I started creating onto the vintage dressmaker dummy about… 3 months ago. Waltzing Matilda was parked in the living room for a while, where I first began working on her, in lovely light. More recently, I stashed her in my bedroom. But — voila! 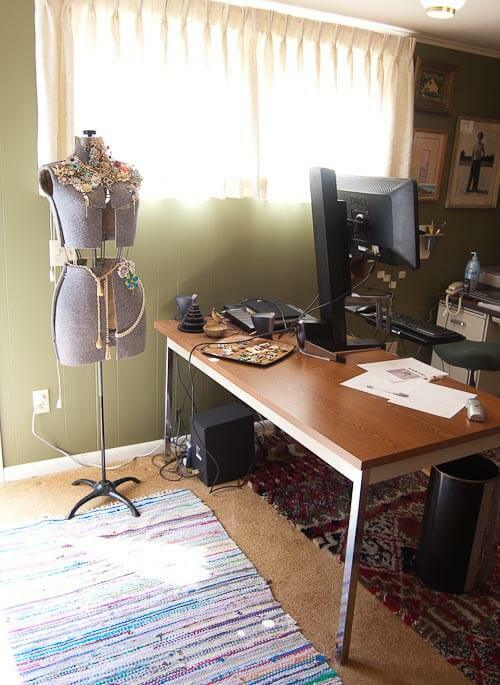 — in she goes to my office and future-crafting center, where I can add a pin now and again at my leisure. What are those things that strippers put on their tatas and make go round in circles? The kitties with their dangling tails won’t stay, but I do amuse myself as I go along. ers come off (the pins are pinned), so that could be a hassle. In other cases, I kind of have them jammed in tight. Did I ever mention that I started making a quilt when I was 35. I worked piecing it together on the sewing machine for about six months. Then I put it away. That was 18 years ago.I fussed around with the exposure, the blacks, the saturation, contrast and recovery on most of these photos. Any way your eye slices it, though, this one will be fun. 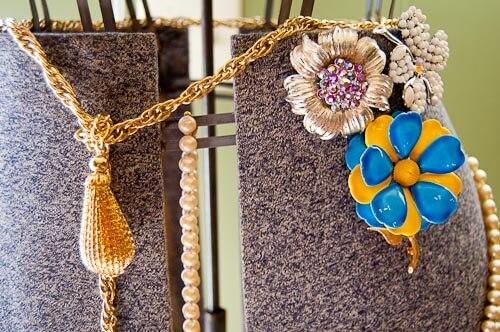 Don’t just stash your costume jewelry in a drawer! 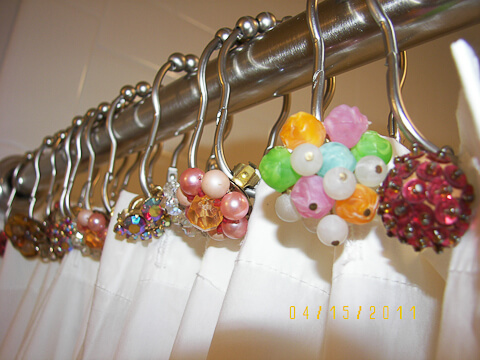 I use costume jewelry to bring 3D effects to my collages… and remember how we used it to bling up my mom’s bathroom (above)? 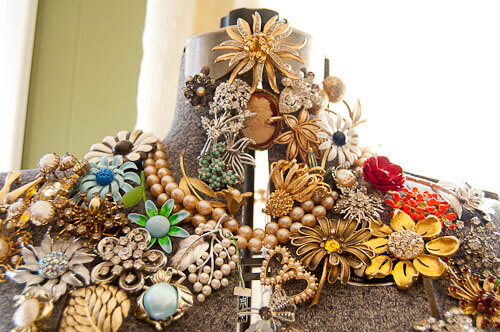 Use your imagination — there are lots of potential ways to make gorgeous home decorations with vintage costume jewelry. 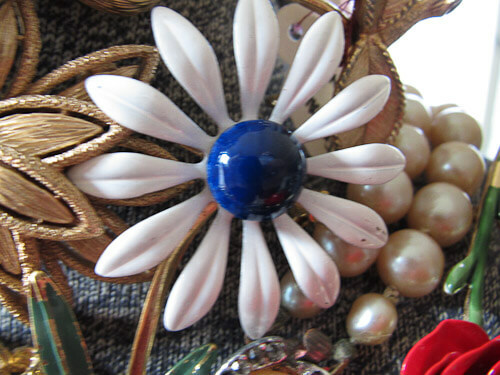 I’ve really been in love with vintage pins and clip-on earrings the last few years, but don’t often buy them except for seasonal ones. You’ve really convinced me to start collecting them in earnest. I wouldn’t be violating my on-going 2008 New Year’s resoluton of not buying anything unless it’s on my ‘list’ (to make the list, an item/category has to be of immediate use to a specific purpose) as long as I decide exactly how I’m going to use them. Of course, that may take a while; everyone has such good ideas on that! 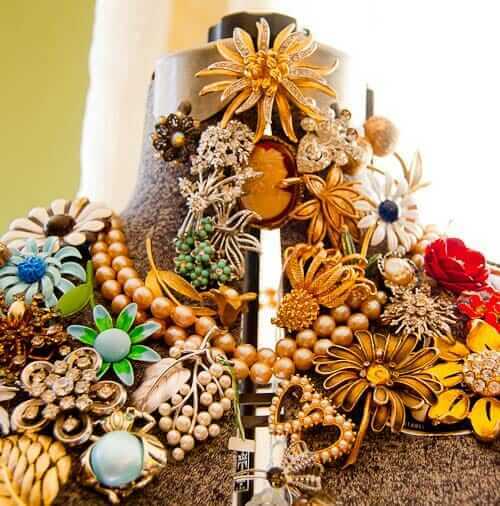 Pam, your dress form is fabulous, a perfect way to collect and enjoy the baubles from the past. Love it! !